State Of Emergency Declared After Quake Rocks Northern Calif. : The Two-Way The 6.0-magnitude temblor caused nearly 90 injuries, widespread power and water outages and damaged buildings in the wine country just north of San Francisco. 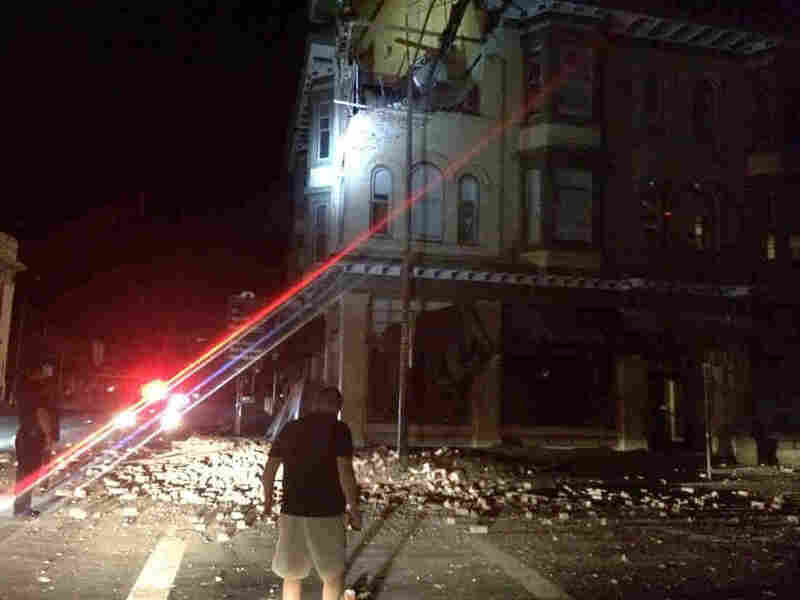 A photo provided by Lyall Davenport shows damage to a building in Napa, Calif., early Sunday. "The declaration means we've exhausted our resources and need help from the outside," Napa City Manager Mike Parnass told reporters at a news conference. He said about 20,000 of the city's residents were without power. He said there had been significant damage to buildings in the city, including some of historic import. Mark Ghilarducci, director of the California Governor's Office of Emergency Services, said at a news conference late Sunday afternoon that the situation had stabilized. Napa Fire Battalion Chief John Callahan said at least 89 people with quake-related injuries at the city's Queen Valley Hospital. At least three people were critically hurt, including one adult with multiple fractures and a young child who was injured when a fireplace collapsed, he said. Characterizing the other injuries, "I am going to assume these are all trauma-related," Callahan said. He said crews were struggling to reach areas to assess damage. Callahan said many buildings had been damaged and that authorities had responded to six separate fires, including one at a mobile home park that destroyed several structures. Callahan said ruptured gas lines likely caused the fires, and that there were "100 plus" reports of gas leaks. 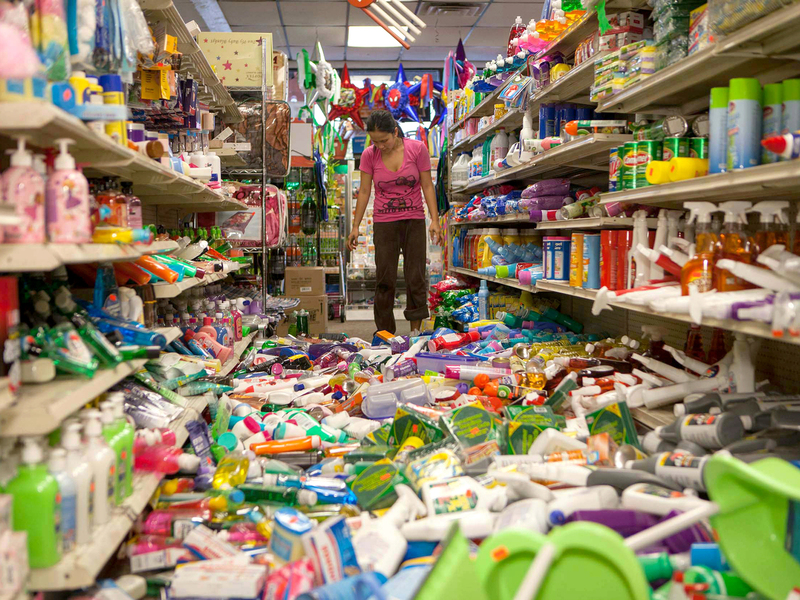 Nina Quidit cleans up the Dollar Plus and Party Supplies Store in American Canyon Calif. after the quake on Sunday. The city's public works director, Jack La Rochelle, told reporters in an afternoon briefing that there had been about 61 water main breaks, but "the good news is that our larger [water] distribution lines have not been damaged." He said inspectors had begun looking at the city's bridges, but they seemed to be "in pretty good shape." He said it may take a week to get everything restored. Although Napa appeared to be hardest hit, The San Jose Mercury News says the area affected stretches from Santa Cruz to Wine Country, including 2.3 million people. The USGS says the epicenter was just north of the Bay area, near Sonoma Valley and Napa Valley and American Canyon. The quake struck at a depth of 6.7 miles, the agency says. CBS San Francisco says it is the largest to hit the Bay Area since a magnitude-6.9 hit Loma Prieta in 1989 and was felt across Northern California. Electric and gas utility PG&E's website shows more than 40,000 customers without power in the area in and around the epicenter are experiencing outages. Craig Miller, reporting for member station KQED in San Francisco, says in Vallejo there are at least seven storefronts, including a Chase Bank, with windows out: "In some cases, glass had blown out into the middle of the street. This was a block with about seven different businesses, including a music story, a bridal store and a jewelry store. You can see that part of the ceiling or roof is coming down in the music store. It's really kind of bizarre — here's one block in Vallejo with all this damage, and then when you look across the street everything is fine." KQED has a gallery of images of quake damage here.